Despite being a specialist nurse, Jo Johnson lacked confidence in dealing with professionals treating her for endometriosis. Nurses can bring a fresh perspective to the development of guidelines produced by the National Institute for Health and Clinical Excellence (NICE). 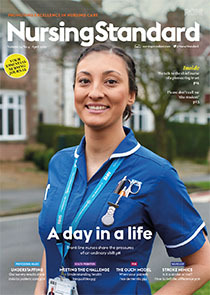 With her background in gynaecological oncology, nurse Cathy Hughes is well suited to her job as cancer lead at the National Patient Safety Agency. Delays in reporting symptoms and in referral to a gynaecologist may result in women enduring the symptoms of endometriosis for a considerable time.